Last week, Baltimore Orioles first baseman, home-runny guy Chris Davis was suspended for 25 games for failing his second drug test. He used Adderall, an amphetamine that is restricted by Major League Baseball. I wrote about the messy business of drug testing and cheating and Chris Davis here. And, here’s the weird thing I just discovered. I started this blog in 2012. That was the summer that Giants outfielder Melky Cabrera was suspended for using performance enhancing drugs (PEDs) and failing a drug test. In my post last week about Davis, I was conflicted. I don’t like cheaters, but hey, we all make mistakes and do stupid things from time to time, right? Was I mad at Chris Davis? Disappointed? Could I ever trust him again? When I wrote about Melky Cabrera in 2012, I couldn’t decide either. Was I mad at him? Disappointed? Could I ever trust him again? That I ended both posts exactly the same way – unknowingly – means what? That I’m hopelessly conflicted? Unable to find the black-and-white answer in a gray-area world? Utterly predictable? Or, that I’m my only plagiarist? Just like the strike zone, balks, the ever-changing rules about blocking the plate, the phantom “almost tags” at second on double plays … baseball might seem black and white on the outside, but inside the rules can get a bit mooshy. To ban Adderall for some players, but allow it for others? I just don’t know. It doesn’t seem so black and white after all. Yes, Chris Davis broke the rules. He admitted that. He’s serving his suspension. But, as CBS Sports reports, Davis may be one of the few players who isn’t “faking” his ADD diagnosis. Read here. Yesterday, with no game to go to (because of that suspension thing) Davis was on his way to the airport to pick up some friends. He came across an accident on 295 outside of Baltimore, stopped, flagged down help, and helped right an overturned truck that had pinned one of its occupants. So, he may have done a bad thing. But, he’s also does good things. How can I stay mad at someone who helps out like that? How can I stay mad when the Baltimore Orioles are one win away from clinching the American League East title? No expert predicted it (except The Baseball Bloggess). And, it hasn’t been easy. Orioles All-Star catcher Matt Wieters? Out since May with a season-ending elbow injury. Orioles All-Star third baseman Manny Machado? Out at the beginning of the season and out again since August with a season-ending knee injury. All-Star first baseman Chris Davis? Out (we’ve covered this). The Orioles are about to win the AL East title with the help of a bunch of non-All-Star Other Guys. How cool is that! It’s been a long time, too. The last time the Orioles won their division was 1997. This entry was posted in Baltimore Orioles, Baseball, Life and tagged Chris Davis, drugs in sport, Melky Cabrera, PEDs by Jackie, The Baseball Bloggess. Bookmark the permalink. Thank you for a fun blog – I love hearing how other teams make it to the end and on top! It’s not the cake walk it started out! I also love how the perseverance of those ‘unknowns’ and their heart for the game watch a team evolve and do great things. Then there are others… dead last! Here’s to you and me and all the fans of middlin’ teams who stick with our teams through the tough years. It makes the winning that much sweeter. Here’s to the Other Guys! May they live long and prosper! Thanks for ending this.blog on such a cheery note. Who needs Earl Weaver and company when you’ve got “Other Guys”? I think Earl would have loved our scrappy bunch of “Other Guys” … not a prima donna in the bunch! (I think the only prima donna Earl ever put up with was Jim Palmer …) Steve Pearce is a total throwback to the Earl-era. The one thing that would have perplexed Earl the most these days? I’m not sure what he would have done with instant replay. 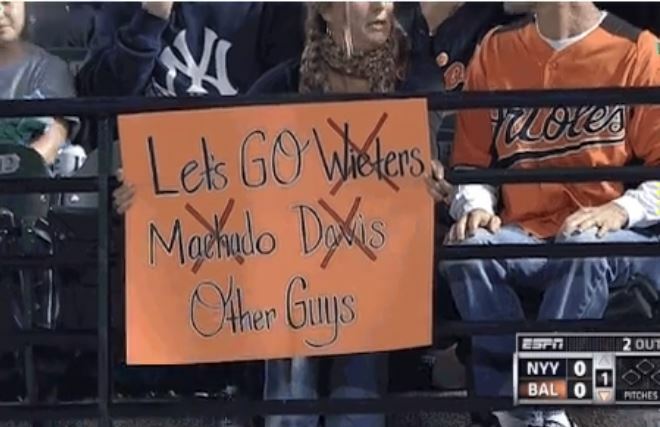 Hahaha, I wondered your thoughts on Davis. Just because somebody is a meathead cheat, it don’t make him a bad human being. He’s just trying to make a living. Funny that I read this right now, because I’m watching the Cards play the Brewers at the same time. I don’t know what it is about him, but I can’t stand Ryan Braun anymore. He’s so smug and probably in his mind, doesn’t think he did anything wrong. If I’m playing poker with a buddy and I find out he cheats, I’m never playing with him again. That these other players are so willing to take these guys back, no questions asked, makes me wonder whether they’re all on something. That or they don’t want each other telling their wives about their road girlfriends. Something. I’m so conflicted over these kinds of things. After all, the Orioles gave a home to Nelson Cruz this season … and that’s a good part of the reason why they’re going to the post-season. Rules are rules and all … but … but … but … October, we get to play in October. Did you see that the the Brewers had Ryan Braun personally call a bunch of season ticket holders last season to apologize for his suspension? That seemed like cruel and unusual punishment. The Orioles have a good thing going this year, with or without the injured stars in the lineup. However, watching them from afar is so much more enjoyable with my subscription to The Baseball Blogess. Even though I discovered this amazing blog post only mid-season, I know now that I was not getting the full view of the Baltimore Orioles beforehand. Great post on C. Davis and having now gone back to the breakthrough piece on Melky Cabrera, I see the bookends. How did I watch the AL East the past two seasons without reading Baseball Bloggess? I just don’t know. Keep pushing your Giants … I’d be delighted to see an Orioles/Giants World Series!